When it comes to capturing “Melbourne Now” it’s hard to overlook the flourishing street art scene, particularly in the city where the laneways are adorned with bursts of colour and conversation. 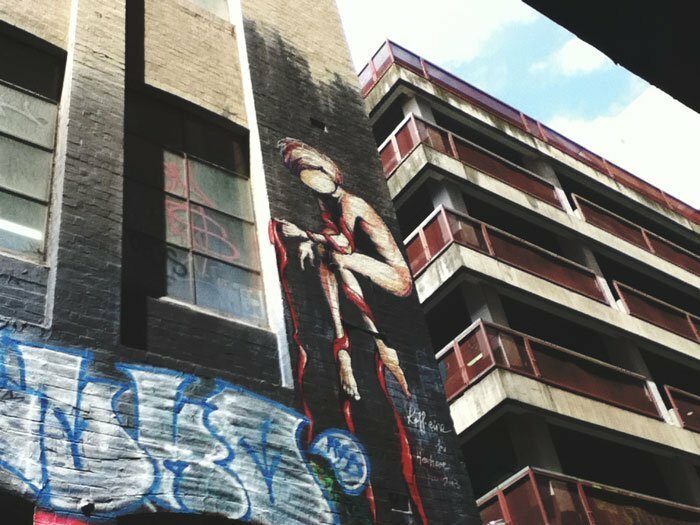 For our latest Roll Around the Block for Melbourne Now, the tiny & little team took a walk through some of the laneways of the city to photograph that street art. We’ve visited the laneways of Melbourne before, but this time it was the whole tiny & little team and a different experience. This Roll Around the Block was a terrific reminder about how it’s okay to break the rules sometimes. For those joining Roll Around the Block for Melbourne Now (read more here), you’ll know the simple premise of this photographic activity – a kid, a camera and 24 shots. We broke every one of those rules on our outing and I would encourage you to not be afraid to do it with your little ones too. The first rule I broke was a kid – there are three in the tiny & little team who all wanted to take part. The second rule I broke was a camera for each to use – we had my iPhone 4S and Mr Little’s iPod Touch. Mr Tiny had brought along his iPod Touch only to discover that it only has a rearward facing camera, so Mr Tiny and Littlest decided to team up and shoot together on my iPhone while Mr Little exclusively used his iPod. The third rule I broke with the 24 shots – at the end of his first ‘roll’ Mr Little asked if he could have another roll of film. Without hesitation we virtually loaded a new film in his camera and he continued photographing. He did that another two times, to shoot four rolls of film overall. Throughout he kept count of what number shot he was up to and he loved having the extra rolls because the artwork blew him away. It just goes to show that sometimes it’s wonderful to bend the rules as it can enhance and extend the fun of this photography project for little ones. Have you done a roll around the block recently too? Don’t forget to upload your photos on Instagram or Facebook with the #rollaroundtheblock hashtag to join our photographic project to capture Melbourne Now through the eyes of children. Team tiny & little would love to see how your little ones view our city!